An engaging suspense, featuring a secret manuscript, a conspiracy, and unwitting pawns caught in the middle. 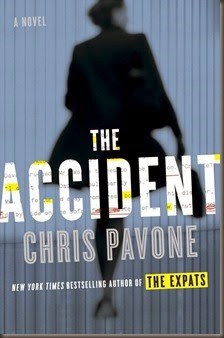 Pavone’s The Expats was an international bestseller – one I seem to have missed almost entirely. When The Accident popped up on NetGalley, though, its synopsis sent it right to the top of my Must Read titles. The story is located at the confluence of a number of my key interests: politics, media, international relations/espionage, and publishing. While the novel is not perfect, it is nevertheless a gripping, fast-paced thriller that entertained and gripped me from the start. The novel details the treacherous passage-to-publication (maybe) of a manuscript that reveals some dark secrets from the past of one of the world’s most powerful media Tycoons – he is a Rupert Murdoch type, but more evil. The author of the manuscript, who remains anonymous throughout, despite plenty of evidence to suggest who it is, has orchestrated an elaborate plan to get the book into the hands of a specific literary agent in New York. He has done this because he knows the way she thinks, and the editor she is most likely to submit the book to (the editor in question is keen on conspiracy books, and desperate for a hit to help right the listing ship of his career). The novel is filled with plenty of nice touches throughout – especially when discussing or focusing on the publishing side of the story – Pavone offers plenty of commentary (some endearing, just as much snarky and cynical), no doubt borne of certain personal experiences? Pavone has a real talent when it comes to characterisation. Each of the people we spend time with are well-constructed and, for the most part, highly realistic (more on this in a moment). I particularly liked the way the author gave passages from different perspectives a different feel. For example, the few parts from the perspective of the McNally & Sons copyeditor were detail-filled and precise. For the main, then, the characters have distinct voices. Sometimes, the male characters blended a little bit, and there were a couple of moments when, after starting a new scene or chapter, there was a moment of “Wait, which one is he again?” These were fleeting moments, but they were there. Apart from these acceptable and forgivable niggles, this was a very good novel – I particularly loved the classic-feel of the conspiracy side of the story (which was frankly refreshing after a decade and a half dominated by US/CIA-vs.-Islamic Terrorists novels). With a couple of good twists and reveals near the end, this is an engaging story, well told. 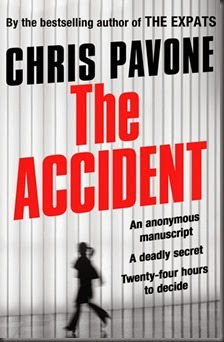 Chris Pavone’s The Accident is published in the US by Crown Publishing, and in the UK by Faber & Faber.